Official Lego track designer - super quick and easy, but no crossovers. That's a fricken awesome layout! I want bridges!!! will have a look at the tools. Thanks Si. Nice resources - thanks, Si ! I've already designed and started to build a layout with a lower enclosed loop and an upper surface loop. Seeing that picture has however got me wondering about whether it might be cool to join the lower and upper loops together with a gradual inclined section. So thanks again but also curse you for sowing seeds of doubt in my mind ! ... then ignored it completely, because with a light PF train you can get up to that height in about 2/3 of the horizontal distance recommended, especially if you use the old blue grippy rails. Also heres something for those who think they dont have room for trains! @Si_Dorking_Surrey_UK great link for building the inclines/declines! I'm excited to try it out! I never went for trains before but that second video got my son giggling with the camera mounted on the train he thought it was great racing round the house like that, got a smile out of me too. Very cool, thanks Si. We (the GWLTS) have done inclines at displays before and you do need a lot of space. Realistically, you can only climb one plate per track length so to rise by 12 bricks or so needs 36 lengths which is quite a distance. To build on the OP, I'd definitely recommend BlueBrick. It's easily extensible you will soon learn to appreciate its support for layers,l allowing you to separate tables, baseplates, track, monorail and annotation. It's also really easy to add new parts; I added the standard tables we use and public shows as ours are custom sizes. As for inclines, I'm sure lighter trains can haul themselves over steeper inclines but I'm not about to start challenging my precious 9v motors like that! ...and Technoandrew (the garden trains video) is another Brickish member. Not sure if he's on here though. I worked out the inclines which worked for me by setting up a test slope. Theres probably not a one size fits all solution, as itll depend on number of carriages, (more= heavier), track type (grips or not/ possibly metal is slippier) and power source (no idea about 9v, but for PF i recommend eneloop batteries for max power ..) . Also wonder if more worn wheels might be slippier, certainly seem to be. I also did a test incline. I had to climb 15 bricks. I ignored other advise and tried to go 2 plates per section to save space and Legos. It seemed to work fine with my Maersk train powered by a 9v motor hauling 2 stock cars with 4 stock empty containers. I then tried 8 stock empty containers and that slowed the train considerably. I then put on another Maersk 9v powered engine and it did well. All of this from a standing start to full power pretty quickly. After all of this I tried a stock 7938 Passenger train which ran right up the slope but, the end car would always de-couple itself near the top. Has anyone else had this same problem? The magnets seem to be weaker on this particular train than any other train I have. I don't have a lot of experience with the PF trains but one thing I have noticed is that the receiver on the train is almost blind to the remote so that you have to be in front of it for it to work. Has anyone experienced that as well? So after all of that I did rebuild the incline with 1 plate per section and obviously that made things much easier. Next I think I'll try doing it all with a 12v train. The trains in the Lego idea book 7777 seem to climb 1 brick per section. I've also seen this in most of the 12v train videos on youtube that have inclines. Dont know about that specific train, but I've been using ball and socket joints instead of magnets on my PF tram and they work fine at includes up to 3 or 4 plates per section, so I suggest using those. the receiver on the train is almost blind to the remote so that you have to be in front of it for it to work. Has anyone experienced that as well? Dont know about that particular train, but in general, no. Try clearning the reciever glass and changing the remote batteries. Thanks, guys - as soon as my current Star Wars UCS building frenzy is done I will start to experiment with gradients on my layout. Really looking forward to having a play with this ! I finally got my Yellow Cargo Train and I love it! This is my 3rd train, but first motorized one (already have Hogwarts Express and Toy Story Western Train Chase). I'm thinking about ordering some supplies to expand my track and possibly motorize the other trains. I'm looking at the Train Station 7937 and Level Crossing 7936. How many Level Crossings should I get, one or more? The Yellow Cargo Train already came with 2 Switching Tracks, which I set up like the instructions show (kinda boring). But if I change the layout, would I need more of the Switching Tracks than the 2 it came with, just wondering if I need to order another Switching Tracks 7895 too. Any idea of where I can find pictures of track layout designs? I have no idea how to redesign a track layout or what I'll need. 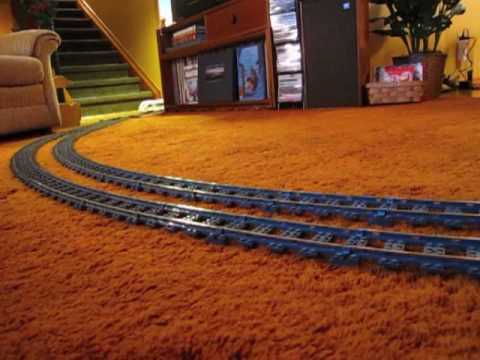 How do I figure out how many straight or curved tracks I would need to make a better track layout? Bluebrick is definitely the way to go. It's got some great features and is supported, most of the others (Track Designer, Track Draw are not). @mr_benn, thank you so much for the information on Bluebrick.